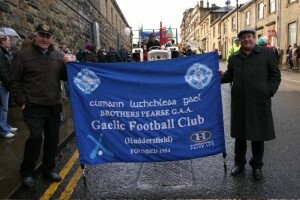 For nearly Sixty years Huddersfield’s Gaelic Football club has been embedded in the pysche of the local Irish people. Secretary, Ollie Walsh, provides a brief analysis. Founded on the 6th October 1954 and fielding teams in Hurling and Football, St. Patrick’s later became Padraig Pearse before modifying to the current title of Brothers Pearse. The founding officers were President, Rev Fr. J Quirke, Kerry; Chairman; Tom Johnson, Cork; Secretary; Tom Hickey, Clare; Treasurer; Denis Collins, Limerick; all Munster men of vision. It was a great occasion for the local Irish people and encouraged the County Board, at a low ebb, to keep going. In 1979 we celebrated our Silver Jubilee with a Dinner Dance, attend by a huge gathering. In 1994 over 400 people attended a function at the McAlpine Banqueting Hall to celebrate a reunion of Gaels and 40 years of the sports. Having played a major role within the county we were delighted to take part in the Golden Jubilee of G.A.A. in Yorkshire. (Hurling ceased in Yorks, early 1970’s) Ninety-nine per cent of the early G.A.A. members were teetotallers and many belonged to The Pioneer Total Abstinence Association (TPTAA) situated in the town. They didn’t frequent Licensed Premises and there were no bars at the Dances so these functions coupled with the G.A.A. were their cultural pastimes. “The Junior Championship Cup was filled with Lucozade.” (Bros. Pearse minute book). As one of the final events in celebrating 125 years of the GAA, Canadian President Brian Farmer (Clonmore, Armagh) will travel from Toronto, Ontario to gather with GAA members to remember the last founding member of CLG, Joseph P. Ryan, on Saturday December 19, 2009 at a 11:00 a.m. mass in St. Mary’s Church in Cranbrook, British Columbia with a wreath laying ceremony to follow at Ryan’s grave. The mass will be celebrated by former Brother’s Pearse member Father Harry Clarke (Bohola, Mayo) and Father Conrado Beloso along with a variety of civic dignitaries in attendance including the Mayor of Cranbrook, Scott G. Manjek, former Mayor of Golden, Jim Doyle (Down), members of a North American fraternal organization Knights of Columbus who are celebrating 125 years in Cranbrook, members of the St. Vincent De Paul Society and former Ministers of the Legislative Assembly. Joseph Patrick Ryan was born in Carrick-on-Suir, Tipperary in April 1857. As a solicitor he practised in Callan and Thurles. He would have known Maurice Davin well and that friendship was possibly the reason he attended the meeting in 1884. In 1899 Ryan emigrated and became immersed in British Columbia’s life with the Board of Trade, the Mining Industry, serving as a Police Magistrate as well as a prominent journalist. A photo by Terry Segarty (Oldcastle, Meath) was taken recently of Ryan’s headstone which was erected by Ryan’s grandchildren in May 2000. Segarty will be hosting a dinner on Friday December 18, 2009 in honour of this historic gathering. Jim Cummins (Tullamore, Co. Offaly) Chair of Seattle’s Irish Immigrant Support Group. Nollaig Shona agus Ath-bhliain Faoi Mhaise Daoibh! The Canadian County Board wishes Brother’s Pearse GAA a happy and holy Christmas and a prosperous New Year in 2010. My father, Peter Freeley, was in the first ever Brothers Pearse football team and was part of the team which won the 1956 Yorkshire League. He has the medal at home. He remembers the founders Fr Quirke, Tom Johnson, Tom Hickey and Denis Collins. The club was originally St Patricks on Fitzwilliam Street, then it changed to be called Padraig Pearse and obviously is called Brothers Pearse now. At that time St Patricks/Padraig Pearse didn’t have their own pitch so they played a lot of games at Halton Moor in Leeds. Hope this adds something to the historical record of Brothers Pearse.